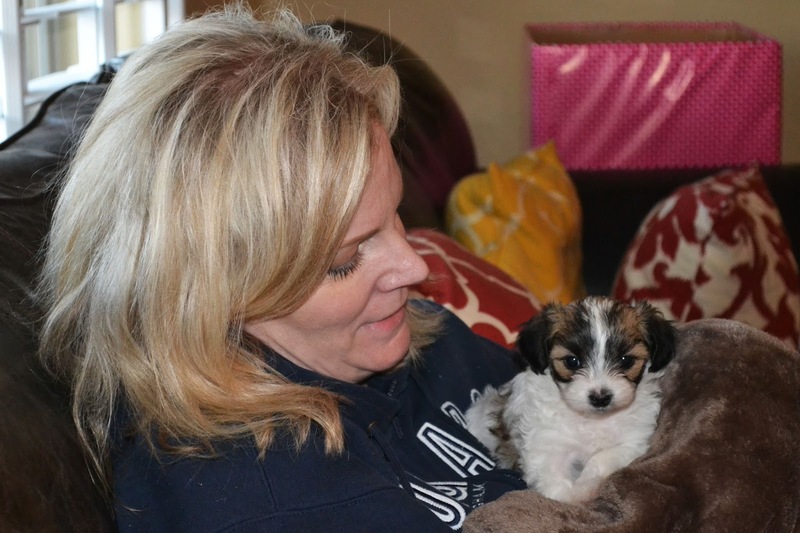 Mom, the Intern: Mom's Cancer Chronicles: new puppy. Mom's Cancer Chronicles: new puppy. After our long-time family dog of 13 years died this summer, I wished and hoped Mom would get a new one. I looked on the Arizona Humane Society web site daily for a doggy she could adopt. I even sent her links to dogs I thought were cute. But she kept saying things like, "I can't bear to lose another pet ... I don't have time to potty train a new puppy ... I think I'm going to go back to work so I can't take on another responsibility." And then, she announced to the family she has breast cancer. Of course, it would be silly to suggest getting a new puppy at a time like that. A person dealing with all the craziness that cancer encompasses has no need for the obligation of a pet, especially a PUPPY. So I pushed that notion aside and felt a bit insensitive for even considering it in the first place. As the weeks went on, I realized cancer was occupying roughly 90 percent of my thoughts. It was consuming me. I would pass people in the store and wondered if they had cancer like my mom. I spent hours on the Internet researching the cancer my mom has and learning about different treatments for her. I thought a lot about my future and wondered if I would get cancer, too. It was the last thing I thought about before bed and the first thing in my mind when I woke up. I worried about cancer constantly. Two weeks after we learned about my mom's diagnosis, we were at my parents' house for Sunday dinner and my mom seemed really stressed. She was not doing well and we could all sense it. My dad, Dill and my brother-in-law Jason gave her a priesthood blessing to calm her down. Afterwards, we were all chatting about different fun, light-hearted subjects but Mom was still a total stress case. She was panicking inside about her cancer and it was clearly consuming her mind, too. About a week later, my sister Sarah called me to tell me she found a Morkie (Maltese + Yorkie) puppy on Craigslist for my mom. I looked at the link and saw that it was indeed the most adorable thing and I knew Mom would love it. The price was right, too. And we'd recently learned Mom would NOT be having chemotherapy right away but would instead take a hormone blocking medication first, so she would be able to take care of the puppy ... plus, two of my sisters still live at home and would certainly not mind helping out. I knew she'd be worried about the cost as well so I offered to pitch in to help pay for it. Sarah suggested we ask my grandpa if he would help, too. I called Papa right away and asked if he wouldn't mind contributing to getting the puppy. Without hesitation, he offered to pay for it completely. So generous of him. He said he knew it would bring my mom happiness at this difficult time and he knew how sad she was when Bisky died. What a great gift! 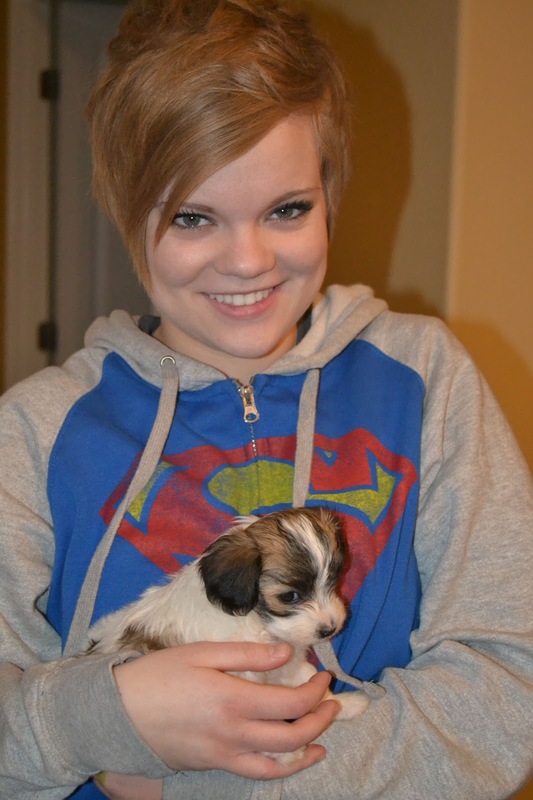 Sarah and Jason picked the little precious puppy up and Daisy became part of the family that night! My sister Mariah got a pixie cut just like mine, so now we REALLY look like twins! 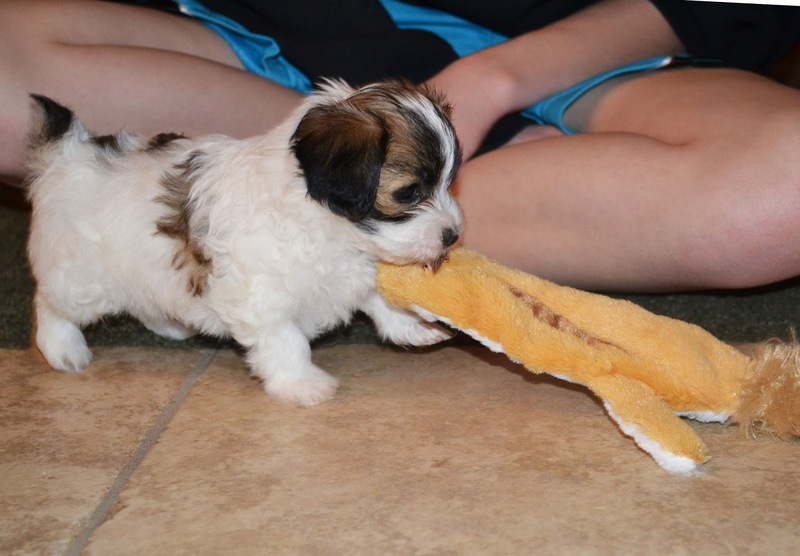 Daisy is so tiny and cute and she's just the distraction the Haney family needed. I'm so glad my mom has a new friend to bring her joy and cuddle and love her when she feels sad. I think Daisy was meant for Mom and know she will be a source of happiness and comfort during this hard time and for many years to come.